A ndie Dominick received the Distinguished Alumni Award in 2018 for her Pulitzer Prize in Editorial Writing. She wrote several editorials covering the topic of privatized Medicaid in Iowa, nine of which were honored with the Pulitzer. Andie graduated from Iowa State University with a Bachelor’s degree in English in 1994, and a Master’s degree in Literature and Creative Writing in 1997. After graduating from Iowa State, Andie wrote a book, “Needles: A Memoir of Growing Up with Diabetes”. 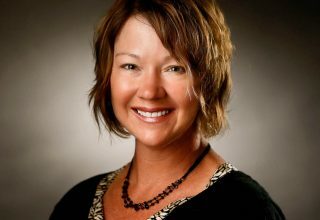 She continues to work for the Des Moines Register covering topics such as healthcare, human services and social issues. Adrienne Lamberti is an associate professor of Languages and Literatures, an Administrative Fellow with the Office of the Provost, and Coordinator of the Professional Writing Program at the University of Northern Iowa. She teaches topics in rhetoric, professional communication, digital media, communication across the curriculum, and organizational culture, and co-founded UNI’s new Interactive Digital Studies Program, now one of the fastest-growing academic programs on campus. Lamberti also has worked as a communications specialist for public organizations such as the Iowa Department of Transportation, and for private industries such as Thomson Publishing. While at Iowa State, she further worked with Extension programs such as the Beginning Farmer Center, and with outreach programs such as the Center for Transportation Engineering and Education. Her research interests include narrative and anecdote as forms of professional communication, and technology-mediated communication genres. Having grown up on an Iowa Century Farm, Lamberti especially is interested in the communications surrounding the food production end of agricultural science, which was the focus of her first book, Talking the Talk: Revolution in Agricultural Communication, as well as the focus of an in-progress collection titled At the Round Table. With Anne R. Richards, Lamberti recently co-edited the collection Complex Worlds: Digital Culture, Rhetoric, and Professional Communication (Baywood Publishing). John Wiley & Sons Publishing recently named Lamberti and Richards the Associate Editors of a new book series, Engineering Transformation: Conflict, Crisis, Adaptation. Elizabeth Wardle graduated with a Ph.D. in Rhetoric and Professional Communication from the English Department at Iowa State in 2003. She is currently an Associate Professor and department chair at the University of Central Florida. She quickly established a major voice in rhetoric and writing studies by publishing in high profile journals, publishing an edited collection and securing a major grant. She has published articles in College Composition and Communication and Writing Program Administration (WPA) Journal, as well as others. She received the National Council of Teachers of English (NCTE) 2006 Best Article of the Year in the Teaching ofTechnical and Scientific Communication for a co-authored article in Technical Communication Quarterly. Her recently published co-edited collection is Writing About Writing: A College Reader published by Bedford/St. Martin’s. She is currently working on a co-authored textbook for use in introductory classes for undergraduate writing majors. She is a participant in a $250,000 grant entitled Next Generation Learning Challenge, which considers best practices in composition courses and includes an online teacher training component with sample course modules. Before coming to the University of Central Florida, Elizabeth was an Assistant Professor and Director of Writing Programs at the University of Dayton. Kerry Skram, obtained her Bachelor’s degree in English from Iowa State in 1995 and performed the role of Laura in The Glass Menagerie on the ISU stage. She then enrolled at the American Academy of Dramatic Arts in New York City and performed in Boston and New York City. Since 2004 she has performed with the Repertory Theatre of Iowa in A Midsummer Night’s Dream, Much Ado about Nothing, The Merry Wives of Windsor, Shakespeare in Love, Twain at Twilight, and many others. She won the Best Actress at the 2006 Wild Rose Film Festival. She also is a playwright, and one of her works is an adaptation of Sense and Sensibility performed last year at Terrace Hill. Ander Monson received an MA in creative writing from ISU and now teaches at the University of Arizona. His books include Other Electricities (novel), Vacationland (poetry collection), Our Aperture (poetry), Neck Deep and Other Predicaments: Essays (nonfiction), and The Available World (poetry). He is the editor of the literary magazine DIAGRAM and the New Michigan Press. His latest book Vanishing Point: Not a Memoir is a hybrid, part print book and part website. The print book includes words tagged with dagger marks (†), which when typed into the website take the reader to the book’s electronic components. Sarah Brown Wessling, an Iowa State undergraduate and graduate alumna in English, was named the 2010-2011 National Teacher of the Year. President Obama conferred the honor on Wessling on April 29 in the White House Rose Garden. Considered the nation’s top teaching honor, this award is sponsored by the Chief State School Officers. Wessling was selected from among the 2010 state teachers of the year. Wessling was named the 2010 Iowa Teacher of the Year by the Iowa Department of Education. She has served as the department lead teacher of Johnston High School in Johnston, Iowa, where she has taught for the past 10 years, preceded by one year of teaching at Cedar Falls High School. Wessling has received numerous awards, including National Teaching Board Certification in 2006 and the Iowa Governor’s Scholastic Favorite Teacher Award recognition. She is president of the Iowa Council of Teachers of English (ICTE) and the recipient of various ICTE awards. Wessling received her Bachelor of Arts degree in English with specialization in Teacher Education in 1998 and her Master of Arts degree in English in 2003, both from Iowa State. She was a recipient of the Graduate Research in Excellence Award for her thesis, which analyzed qualitatively and quantitatively the reading and writing experiences of advanced placement students. Wessling was featured on the cover of associate professor Donna Niday’s first coauthored book on mentoring beginning teachers, and Wessling cowrote a chapter in Niday’s second mentoring book. Mark Zachry received received his Ph.D. in Rhetoric and Professional Communication from Iowa State University. He is an associate professor of Human Centered Design & Engineering at the University of Washington. His research areas include the communicative practices of organizations, communication design, and the rhetoric of technology. A focus of his recent work has been on the development of meaningful models of communication as it is practiced in organizations. His publications include the co-edited work, Communicative Practices in Workplaces and the Professions: Cultural Perspectives on the Regulation of Discourse and Organizations. Dr. Richard Johnson-Sheehan joined the faculty at Purdue University in 2004. He teaches courses in Classical Rhetoric and Professional Writing. He is also a mentor to new teachers in the department. His most recent book is Technical Communication Today from Long man Publishers. He is currently working on two projects. The first is a book on the rhetorical origins of the quantum theory. The second is a study of ancient Irish rhetoric. Dr. Clay Spinuzzi is an associate professor of rhetoric at The University of Texas at Austin. Spinuzzi’s interests include research methods and methodology, workplace research, and computer-mediated activity. His book Tracing Genres through Organizations: A Sociocultural Approach to Information Design, published by MIT Press in 2003, was named NCTE’s 2004 Best Book in Technical or Scientific Communication, one of four NCTE awards the author has received. His second book, Network: Theorizing Knowledge Work in Telecommunications, was published in 2008 by Cambridge University Press.